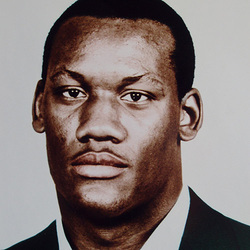 Dan Stubbs was a consensus All-American defensive end in his senior year of 1987 when the Canes won their second national championship. He was one of three finalists for the Outland Trophy and one of 12 finalists for the Lombardi Trophy. UM's sack leader for both single season (17 in 1986) and career (39.5), he also had 25 tackles for loss and 267 total tackles and holds the school record for his position with 139 assists. He was selected to play in the 1988 Japan Bowl in Tokyo. A second round NFL draft pick of the San Francisco 49ers, he also played for the Dallas Cowboys and the Miami Dolphins.